Delta T is the difference between Terrestrial Time (TT) and Universal Time (UT1) i.e. Delta T = TT – UT1. It is a measure of the difference between a time scale based on the rotation of the Earth (UT1) and an idealised uniform timescale at the surface of the Earth (TT). TT is realised in practice by TAI, International Atomic Time, where TT = TAI + 32.184 seconds. In order to predict the circumstances of an event on the surface of the Earth such as a solar eclipse, a prediction of Delta T must be made for that instant of TT. 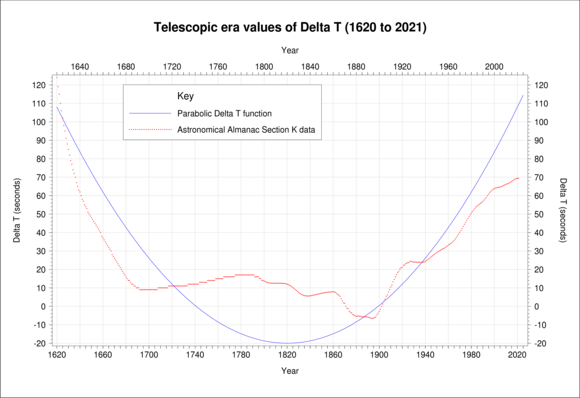 The above diagram displays the values of Delta T for the telescopic era (1620 to the present) as tabulated on pages K8 and K9 of the current edition of The Astronomical Almanac. Data are given for the beginning of each year. A simple parabolic function used to estimate Delta T is also plotted for comparison purposes. It takes the form Delta T = – 20 + 32T2 (Morrison & Stephenson, 2004) where T is the number of centuries since 1820. This function is based on the assumption that the length of the mean solar day has been increasing by about 1.7 milliseconds per century. The above diagram shows the values of Delta T tabulated daily for the interval 2000 January 1 to the present as derived from the (UT1 – UTC) smoothed data provided in Bulletin B of the IERS, the International Earth Rotation and Reference Systems Service. It also shows the daily Delta T data and predictions provided with the USNO MICA v2.2.2 software package.  The predictions used by MICA are occasionally updated; the data used here are those whose predictions of Delta T start on Julian Date 2455745.0. The current observed Delta T trend lies very close to the recently released MICA v2.2.2 predictions but is increasing more rapidly than the data derived from the (UT1 – TAI) predictions of the IERS Sub-bureau for Rapid Service and Predictions. The average annual rate of change of Delta T since the beginning of 2010 is approximately 0.375 seconds per year. The above diagram again shows the values of Delta T derived from Bulletin B of the IERS. Two sets of predictions are also provided for comparison purposes. The daily Delta T data and predictions are plotted for the interval 2000 to 2050 from MICA v2.2.2 as described above. 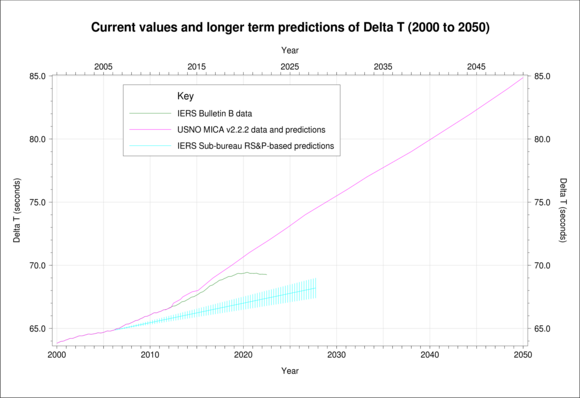 The predictions derived from the IERS Sub-bureau for Rapid Service and Predictions are also plotted for the period 2006 April 1 to 2027 October 1 along with their uncertainties (vertical error bars). The current trend of observed Delta T data lies close to the recently released MICA v2.2.2 predictions. This diagram illustrates the problem faced by almanac producers when trying to estimate suitable values of Delta T for future almanacs.